Situated around two stunningly beautiful natural harbours, Auckland is one of the most important cities in New Zealand’s popular North Island. Located to the north of the island, Auckland enjoys a good climate which sees average high temperatures peaking in January and February. The city is cosmopolitan, with plenty of people residing there of Maori and Pacific Islander descent as well as inhabitants who originated in Europe and Asia. 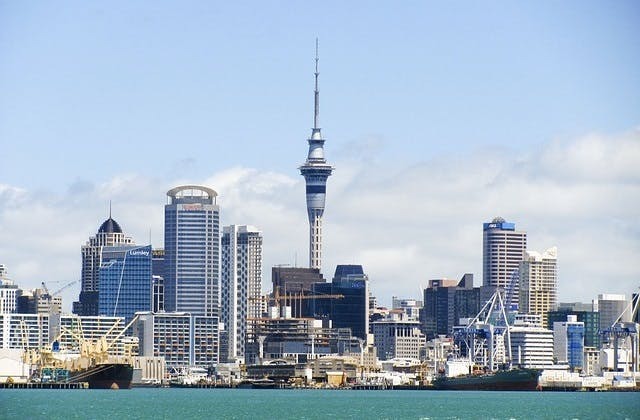 Auckland is one of the cultural centres of New Zealand and is home to an annual comedy festival, the nation's film festival and a full time symphony orchestra. The city has a wide range of accommodation on offer for visitors, with anything from luxury villas and hotels to backpackers hostels and self-catering cottages available. In terms of its scenery, Auckland is in a class of its own. Much of the coastline, outlying islands and nearby mountains are the result of millennia of volcanic activity. The city lies on an isthmus which connects to larger areas of land that would otherwise be separated by the sea. As a result of this geography, the city enjoys some 2,300 miles of coastline, much of it rugged and inspiring. There are also in excess of 13,000 miles of rivers and streams in the area, making for some great walking country. Nicknamed the city of sails, Auckland is probably the city most obsessed with sailing than any other in the country. In the region of 13,000 yachts and other vessels are registered in the city and tourists find it easy to find a yachtsman or woman who can show them the ropes. The other sport that dominates New Zealand's culture is rugby union and Auckland is no exception. It is played in the winter months at Eden Park, a stadium that is turned over to cricket in the summer. The city also boasts a well deserved reputation for retail. The city's main shopping districts are in Queen Street, Ponsonby Road and Newmarket. For an alternative retail experience, many visitors choose to head to the city's two flea markets instead at Otara and Avondale. Smart shopping malls are to be found at Sylvia Park and Albany, too. Auckland has the Coordinated Universal Time value of 43200. Auckland has the IATA airport code of AKL. The slowest flight to Auckland is 320 hrs 30 mins from Auckland flying Thai Airways. The closest international airport to Auckland is Norfolk Island in Australia.